Choices in videogames are terrifically tough to pull off. I’ve never made a game before, but you should trust me anyway. Think about it: imagine coming up with a narrative that is enticing enough for you to continue playing and works with the game’s design philosophy and features. Now, once that’s done, you need to do it all over again for each branching path. With series such as Life is Strange in mind, the best adventure games do this in order to imbue each choice some degree of consequence. If you’re posed a dilemma, but the result is the same either way – I’m looking at you, Anthem – it is no such thing. Weaker choice-driven games are guilty of this and use their faux conundra to conceal their true linearity. 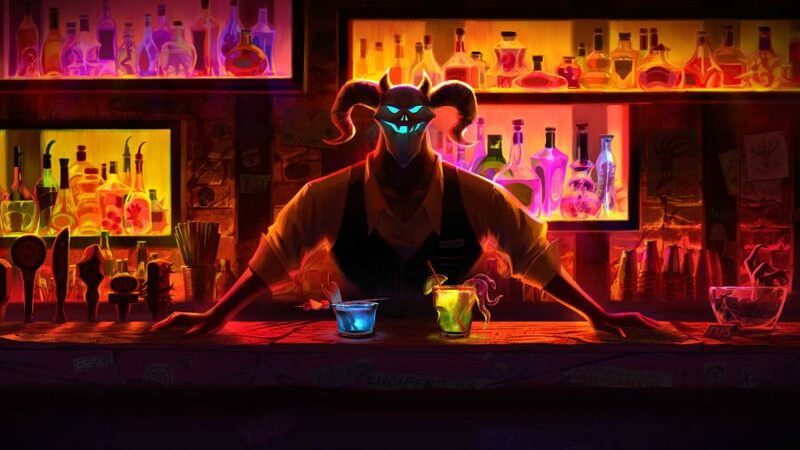 Considering that Afterparty is made by Night School Studios – the developer behind the excellent supernatural choice-’em-up, Oxenfree – that this is a game that gets its narrative junctures right should be no surprise. What’s more, your decisions are driven by something you should absolutely not make more of once you’ve had your fill: alcohol. Afterparty sends you into the bars of Hell, and, no, I’m not talking about London’s Soho district. You play as Milo and Lola, two thrill-seekers that have just kicked the presumably vomit-filled bucket and found themselves in the fiery pits of eternal damnation. But, as you stroll through myriad neon-lit boozers, thumping dance music reverberating around your eardrums, this is not the Hell with which you’ll be familiar. Now, it’s up to you to out drink ol’ Lucifer to give yourself a second run in the land of the living. The most important choices, as ever, come when you reach the bar. As with Oxenfree, conversations are allowed to flow naturally, but other options will present themselves depending on your choice of decidedly unpleasant poison. Some will make you more confident, others more coquettish. However, some NPCs won’t take kindly to your newly-sozzled attitude, thank you very much, which threatens to lock out future dialogue options. It’s essentially an Old Testament take on Deconstructeam’s The Red Strings Club. I started with a Bloody Stool – yes, I’m still talking about beverages, here – before challenging some devilish ne’er-do-well to a game of beer pong. As Lola, I now have a fuzzy ring-shape drunk meter floating above my head after downing my grim concoction. Now with an extra dialogue option coloured in the red of the drink that is now becoming intimate with my bloodstream, I can rudely trash talk my opponent and glory in my victory as the sore winner I probably am deep down. But, before we get to that, Afterparty isn’t all choices and chatting. This tense match of rather unhygienic ball-throwing is a side mission, and just one of the ways for me to reach my central goal of reaching the more exclusive bash upstairs. My pride at having sobered up just as the match started was short-lived: each successful shot my rival threw meant that I got a little more boozed, meaning the dotted line indicating my throwing trajectory trebled. I was still victorious, though, obviously. Now that I had reached the upstairs party, it was Milo’s turn to (moon)shine. For him, I ordered The Last Word, which gave me the confidence to insist that our hell-dwelling tour guide cut the small talk and tell me how on Earth I could get back to, well, Earth. Again, I chose dialogue that would have been unavailable to me otherwise. Even though the destination in my short GDC demo was the same – that my mission is to out drink the devil – it felt like I had arrived their in my own way, with my own take on hammered subterranean networking. Choice in Afterparty isn’t just handled in a unique way: ethanol-based decision making is also an intriguing means for Night School Studios to examine human behaviour. Afterparty reminds us that, when we’re drunk, alcohol is enhancing different aspects of our personality that would otherwise be inhibited. It both speaks for us and unleashes what’s already there. We would simply not behave nor make our usual choices in the same way without it, and it’s in these moments that Afterparty is at its most promising. Just make sure you don’t have too much and make the kind of choices you’ll regret the next. That is, for want of a better word, Hell.